Shovels await the ceremonial dirt-turning by dignitaries at the groundbreaking for a new outpatient care center scheduled to open in Upper Arlington in August 2016. Ohio State University Wexner Medical Center officials broke ground last week for construction of a new ambulatory health care center in Upper Arlington’s Kingsdale Center that they said will improve the health of people throughout the region. “It will probably be the most comprehensive health center that we have to date,” said Dan Like, executive director of ambulatory services at OSU Wexner and project manager for the new facility. 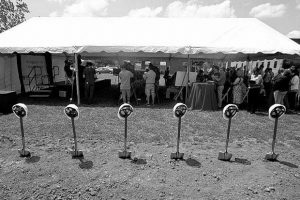 About 100 representatives of the medical center, the city of Upper Arlington and construction officials attended the June 23 ceremony. The five-story, comprehensive care facility is expected to open in August 2016 at 1800 Zollinger Road. Once completed, the 100,000-square-foot facility will provide primary care, heart and vascular services, women’s health care and women’s health imaging; specialties such as dermatology, endocrinology, rheumatology and digestive health services; and a general surgery clinic and laboratory and X-ray services. “These services were selected based on looking at the needs of the community and surrounding communities, and really on keeping people well,” Like said. Medstone LLC finalized negotiations in April to purchase the 5-acre site for the project at Kingsdale from Upper Arlington for approximately $1 million. The company will own the land and OSU Wexner will operate the facility. It’s expected to employ 150 to 160 people and generate $465,000 in annual payroll taxes by its fifth year of operations, according to city officials. Upper Arlington City Manager Ted Staton said the project will bring world-class health care to the residents of Upper Arlington and also signifies another positive development for Kingsdale. Upper Arlington officials have said the project likely will produce $20 million in real estate investments. Upper Arlington City Council President Don Leach said Kingsdale is now the place to be. In April, Like said more than 13,000 OSU alumni and 4,000 OSU health plan members reside in Upper Arlington. Dr. Sheldon Retchin, executive vice president of Ohio State’s health sciences and chief executive officer of OSU Wexner, said last week those ties to the community made the project a no-brainer.